A plan and consistency build a business. And if part of your marketing plan is to build a following — which it should — LinkedIn is a powerful tool. 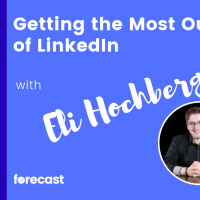 If you don’t already have a daily LinkedIn routine, I highly recommend you listen in on my candid conversation with LinkedIn powerhouse, Eli Hochberg. Even if you do… listen in and grab some fresh perspective. The right time to post on LinkedIn. The distinction between being popular and growing a fan base. How to create effective calls to action. How to develop a daily routine. Click the link below and get the insider secrets in my 40-minute conversation with Eli. His “30 Days Social” is transforming how business owners approach social media.